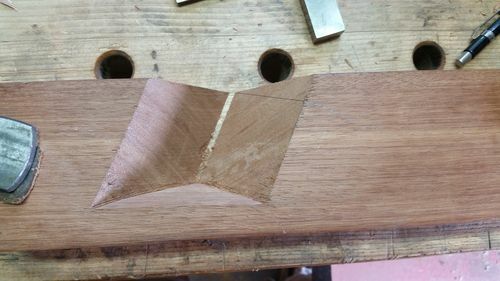 Mouth opening has been cut and worked to final dimension. Now it’s time to get the frog to fit. 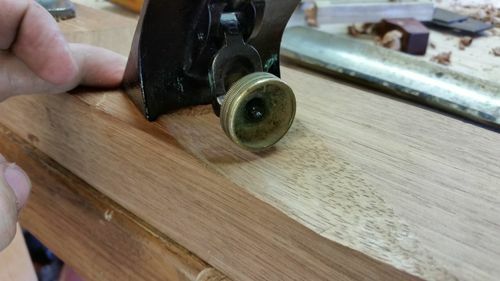 A transitional frog has the little bump out on the bottom where the lever cap screw attaches. On an original body, there’s a pocket for that part, we just need to recreate it. 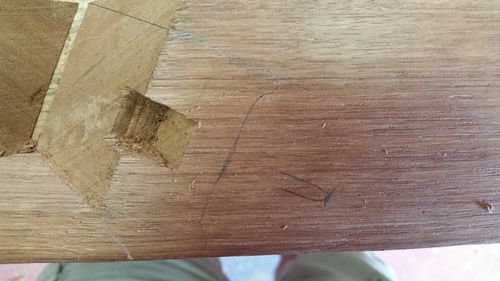 Easiest way to mark it out is to first use a small square to mark a line perpendicular to the bed intersecting the line on the face of the bed. This will be the edge of the frog. Then lay the frog face down and mark the bump out location. Finally, use the frog to determine depth in both directions. Once this area is marked out, the waste can be chiseled out. 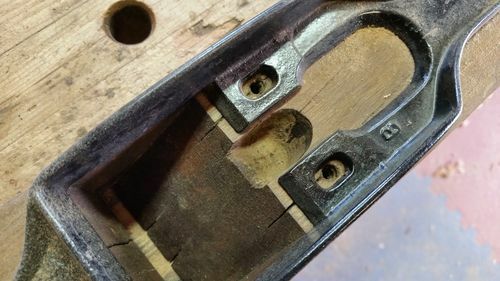 You’ll need to remove the depth adjuster to check fit, as it extends below the base of the frog. Once you have a good fit and are satisfied, mark the back of the frog. With whatever tools you have and are comfortable with, you’ll need to create a channel so that the depth adjuster can operate freely. I used a couple of gouges and did this by hand, working from the edge of the blank and stopping at the line that marks the back of the frog. There are several other possible ways to accomplish the same thing, only limited by your skills and available tools. If you have a good idea on how to do this easily and cleanly, please share. As a nurse, I was always taught, If you didn’t document it, you didn’t do it. Glad to see builds like this documented! This is so interesting Jay. Thanks! 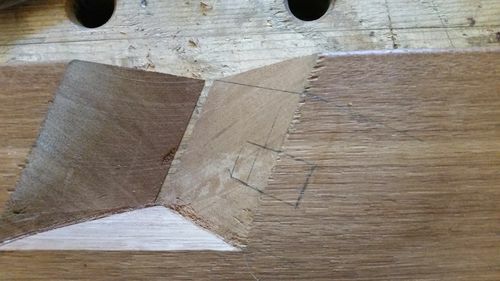 Hmmm, I’m trying to think of another way to create the channel for the depth adjuster since I don’t have a gouge. May have to acquire one. Hmmm, I m trying to think of another way to create the channel for the depth adjuster since I don t have a gouge. May have to acquire one. No reason it can’t be a flat bottomed channel, or a V shaped one. 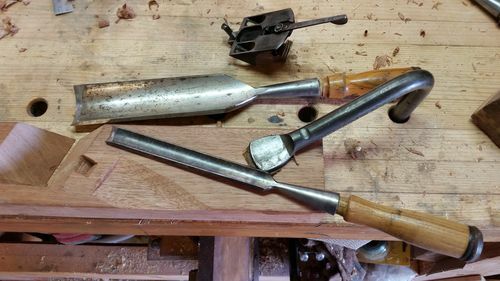 Either of which could be done with bench chisels. 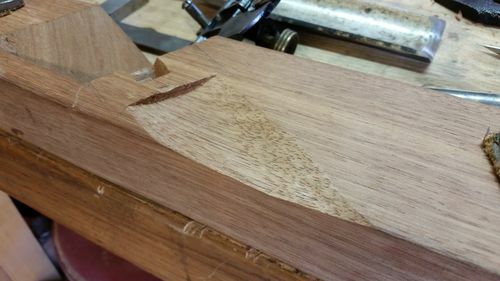 A flat bottomed channel could also be made with a router or router plane. 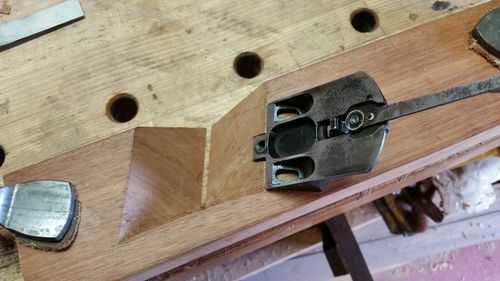 You could also possibly create it with a careful cove cut on the table saw or use a router with a bowl bit. Lots of possibilities, limited only by what you have available and are comfortable with. JayT I just ran across this today – awesome series. Thanks. I’ve got the right sized frog, ready to build!